We haven’t used the shower in a couple of years because it started leaking through the floor (we noticed because a water stain appeared on the ceiling downstairs). There’s a shower in Steevenson’s bathroom, so we’ve just been using that one ever since. Another thing we’ve never loved about this shower is where the controls are in relation to the shower door. You have to step way in to turn it on and if you forget to turn the shower head, you get doused with water that hasn’t warmed up yet! It’s clad with a faux travertine-style ceramic tile that isn’t our style so one day we’d love to have it removed and have something lighter and brighter installed. Everything is currently coated in a shade of tan. Even the trim and door is painted a light tan. 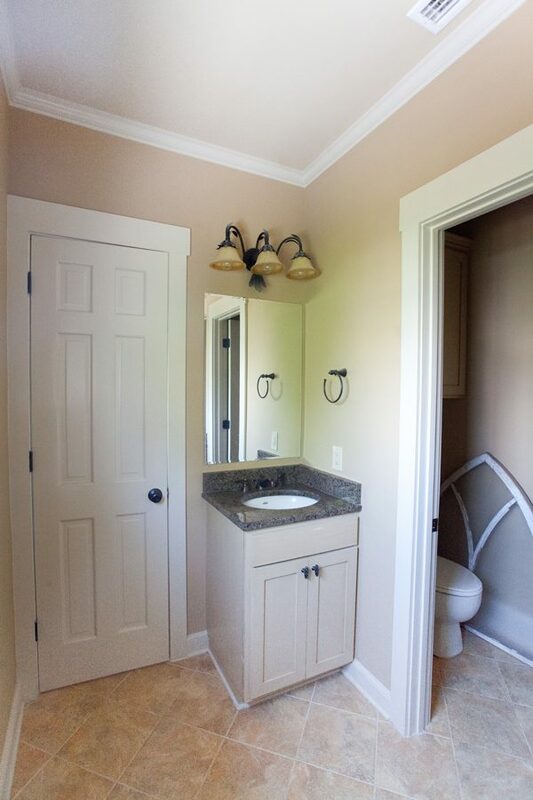 I know the designer who worked with the builder on this (spec) house probably thought she was choosing “safe” colors, but to use so many of the same shade really doesn’t let any part of the room shine because *nothing* has personality. It’s all just different shades of the same. 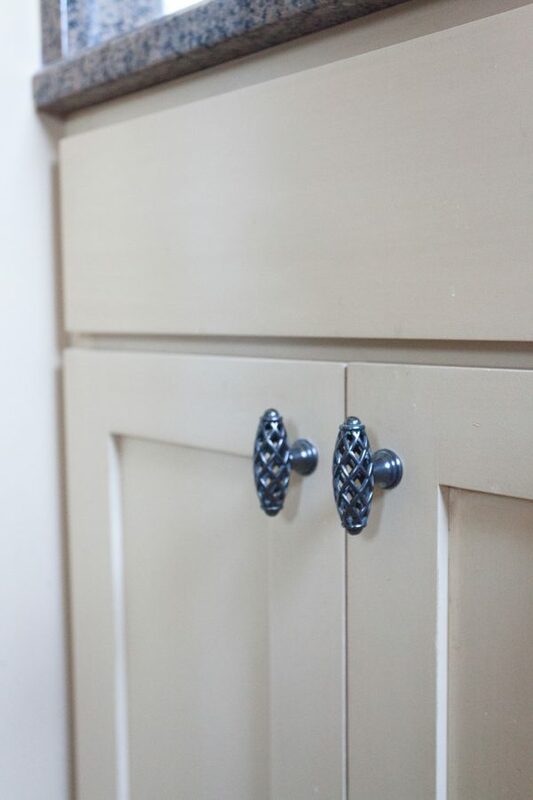 The cabinets are sort of mustard-tan but they’re really nice and solid. 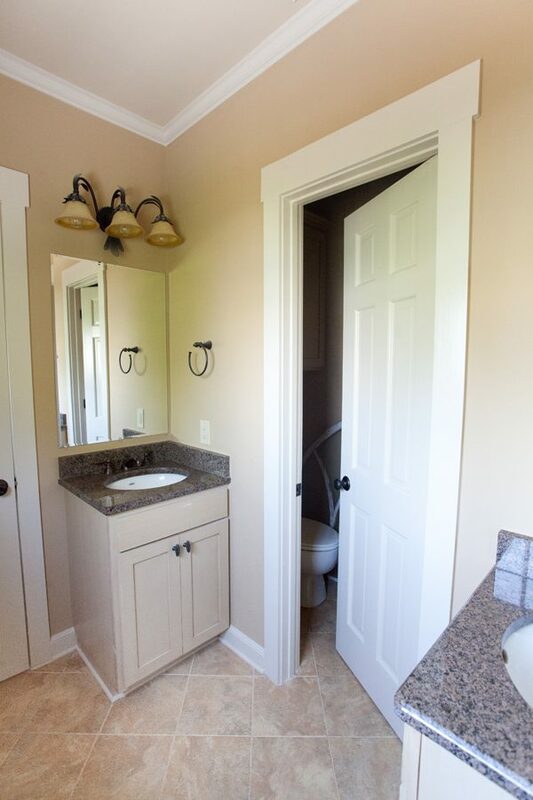 There is a big upper cabinet above the commode, but other than that the room really lacks good storage space too. 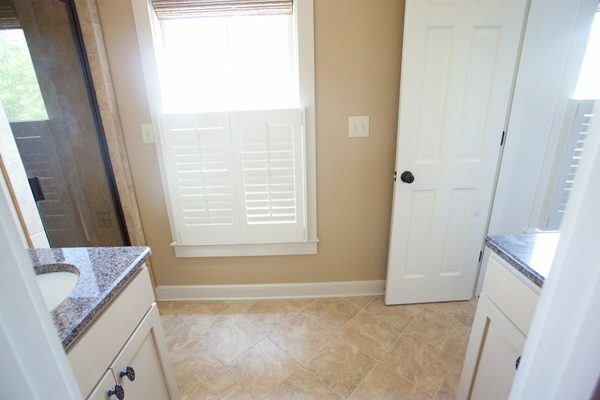 You can really see how small the space between the vanities is in that shot. 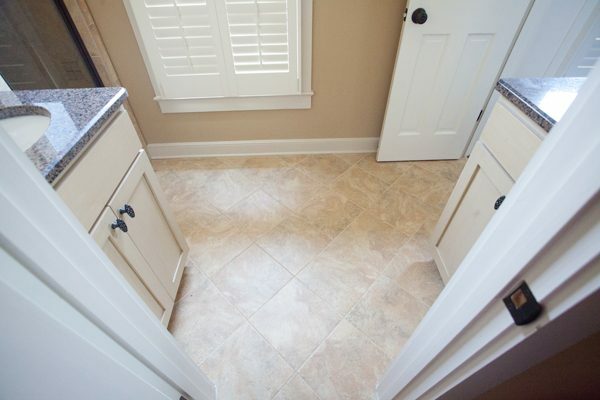 If you count the 12″ tiles, you’ll notice that there are only three between the fronts of both cabinets. We learned really quickly that only one of us could stand there to blow dry or spray anything on our hair- ha! Back in the day, I wouldn’t have been able to wait to even temporarily remodel a space like this, but as I’ve gotten older, I prefer to wait until we can tackle it all at once. (I should mention that I did have the shutters and woven wood window shade installed a couple of years ago because it was easy to do that one window and we needed the privacy in there.) And in the back of our minds, we’ve never really known if this master bedroom would always need to be a master bedroom (and need two vanities) because Kevin’s mom and dad built a master bedroom downstairs. One day, that will likely become the home’s true master bedroom, and our current master bedroom/bathroom would likely become a second bedroom upstairs. That’s a whole lot of space for just a toilet. 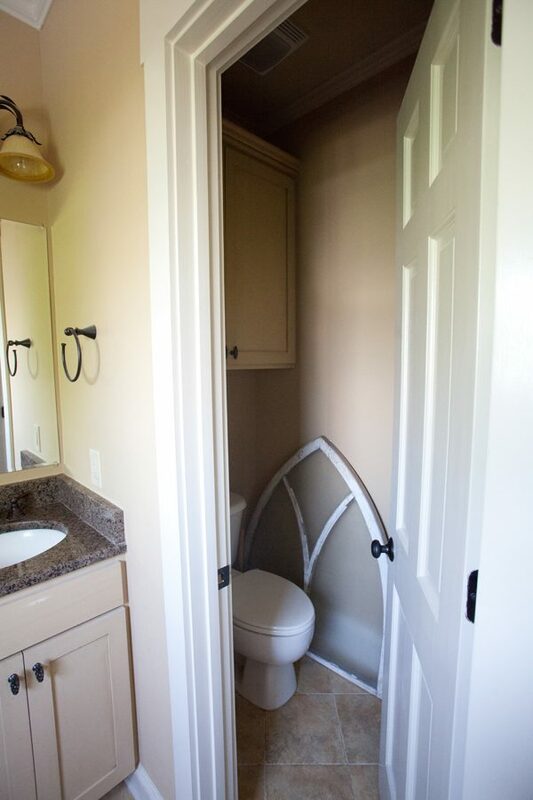 I’d rather have those walls down and have larger more workable vanities even if it meant the toilet wasn’t in a “closet”. Especially since you have other bathrooms to go to for privacy if the other is getting ready. We have a wonky bathroom too – and man are they pricey to fix. Melissa, I agree with your ideas. 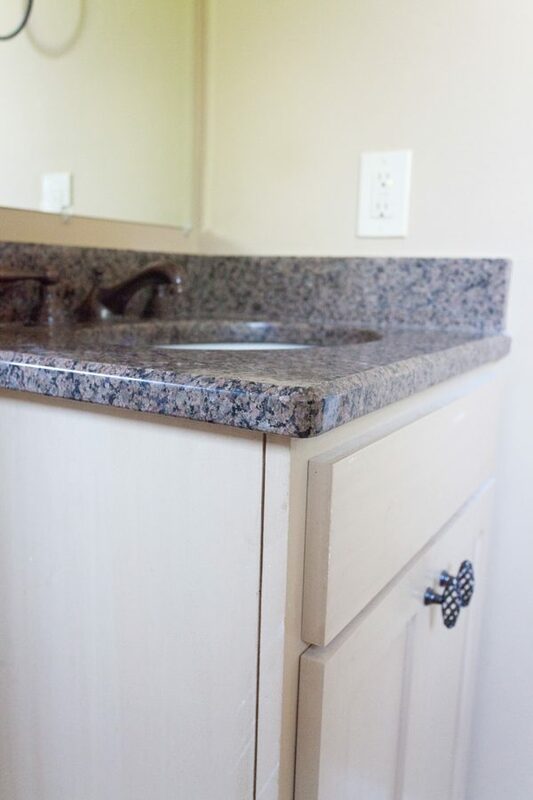 When we redid our MB there was only room for one sink, but it sits in the center of a five foot counter. I’d rather have the counter space than two sinks. 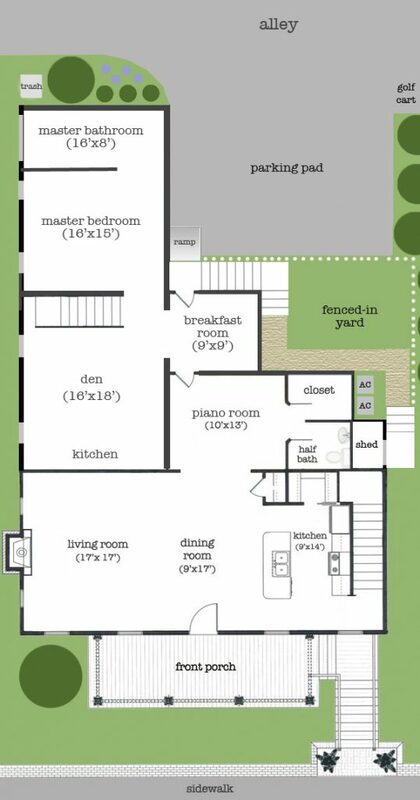 I think you could probably get away with cutting the master bedroom in half, and still have room for a hallway past the first bedroom to get to the second bedroom (which would adjoin the current master bath). OR take out the current master closet and master bathroom, make that a hallway, and cut the master bedroom into two smaller bedrooms for kids. Then you’d have to rework Steevenson’s bathroom to have hall access. But none of those are quick or inexpensive solutions, so they might not be realistic for your life. 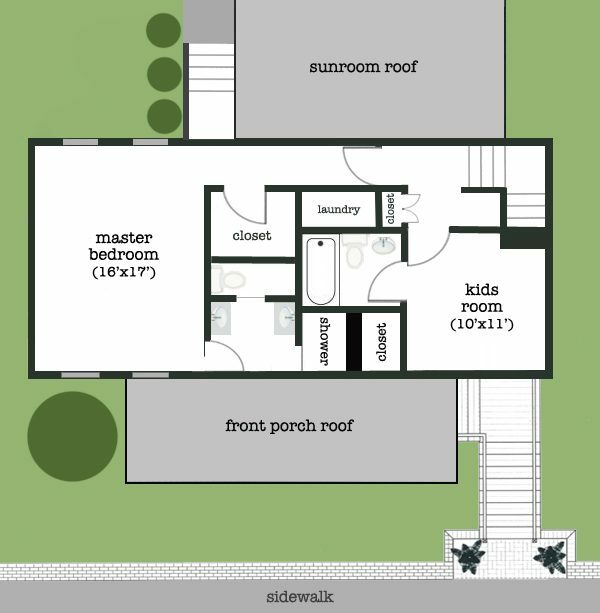 🙂 I know when I looked at the floorplan of our house on paper, it helped me see where I could rework some areas that I couldn’t envision when I was actually standing in the room. Good luck! Whatever you do, it will certainly be beautiful! Oh, how I have mulled over those *exact* same ideas, Sarah! 😀 Kevin’s not a fan though, and since I’m not 100% about them either, we’ll probably just keep the room as-is. Expand 2nd floor out over sunroom for third BR. That is one strange bathroom floor plan. Move door from bedroom to where one vanity is. Drop the second vanity and install double vanity under window. Open up shower with glass wall opening on the left. you can build in front of the window. 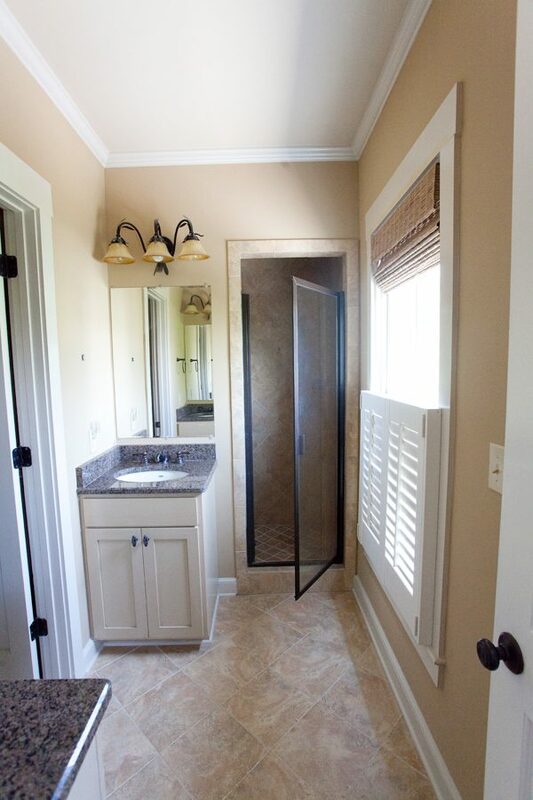 Just put in a half window shutter that closes off the bottom part to the outside – then build the vanity around it. Or you could put in an entire shutter in the window – then build around it. You would love the light that way, but not sure that matters. ALSO – if you want to build another bedroom, think about getting a home improvement loan. that’s what they are for!!! Take out the water closet wall when you re-do the bathroom. It’s wasting space. Then if you move things around you gain so much more room to work with. Yes, the bedroom arrangements for fostering is what ultimately prevented us from bringing home a little boy two years ago. He was too young to share a bedroom with my teenaged son and could not share with my daughter because of the gender difference. We could not afford to add on a bedroom and there did not seem to be another workable alternative within our home. I was angry and frustrated that the logistics of a bedroom prevented this. Two years later, I console myself with the thought that if God had intended for us to add this child to our family nothing could have prevented it. Conversely, if He had other plans, nothing in our power could have made it happen. Does Kevin’s parents mind that you have to go through their breakfast room to come and go. I imagine for both that would be a little intrusive or uncomfortable. Cue 1000’s of women simultaneously mentally redesigning your space. It sure is an awkward layout….obviously not designed by a woman! She commented here on my blog one time…something about not having much flexibility for some reason. Anyway, good luck…..you do such a wonderful job with space planning and working with what you have so I know you’ll figure it all out! Yes, just meant that we were told opposite genders can’t share. What about this: take out the walls for the w/c, rotate the toilet to face the front window, put double sinks on wall against shower wall (facing the door to bdrm.) 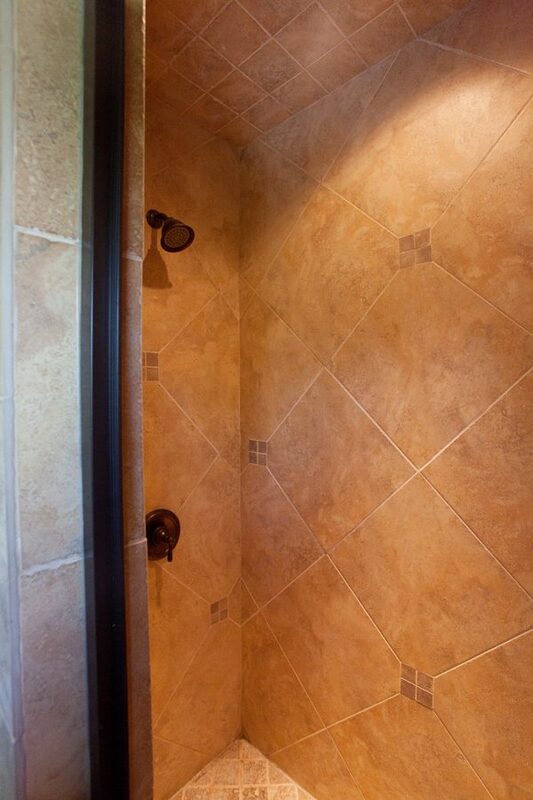 The wall space then left as a shower wall could become a glass wall/shower door. Only plumbing to change would be the vanity that is currently by the bdrm. door. I *think* you can reconfigure the plumbing for the double vanity relatively easy. And they now have paint for tile, although I wouldn’t paint the shower tile unless the product says it can be used in wet areas! At least it would be less costly than a complete gut job! As to the future possibility of needing another bedroom, the music room would be easy to convert to a master. 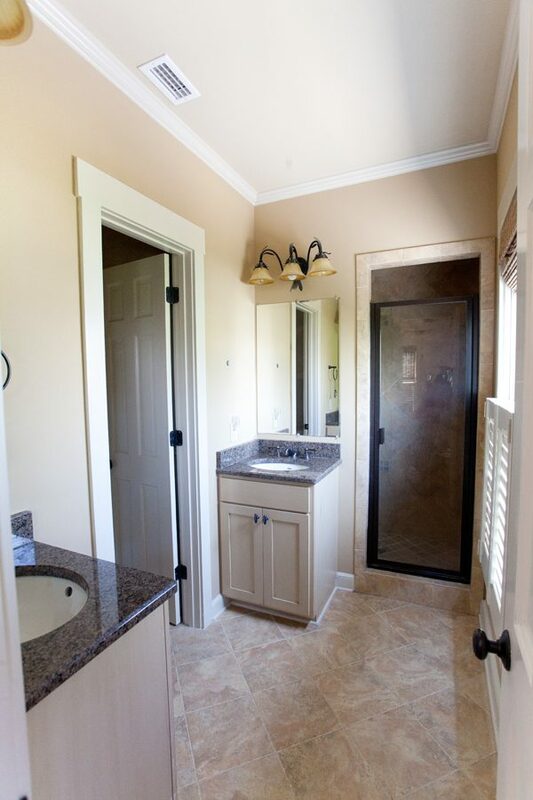 You could get by with just the powder room, since you already shower in another bathroom! A couple of walls for hallways to bathroom and to back door, so no one has to travel through the bedroom itself. Hey Layla. Kinda fun to think outside the box and re-imagine your spaces. Might it not be possible to break through from your master bedroom closet (the large one alongside the laundry) through to and including your master bathroom to make into one bedroom for another future kiddo? I am not sure if your drawings are to scale but it appears that this might be an option? You would then need to obviously remove your passage door that blocks your entire master suite and put a door right at your bedroom – if that makes sense. Good luck and happy imaginings! 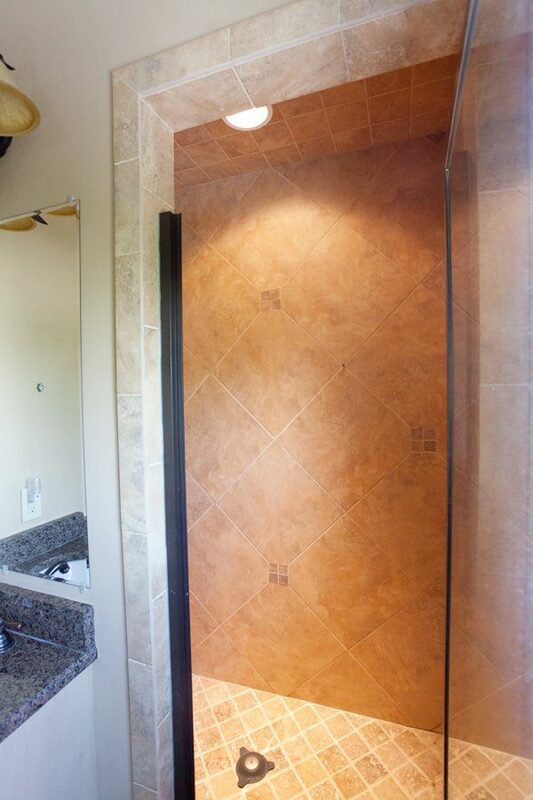 Does your shower really need a door? Appears showerhead etc are at end next to vanity, looks like that partial wall would contain most the water? As to water closet , Boy wouldn’t it be nice to rip out the wall where door hinges, leave partial wall next to toilet and still gives some separation, but sure opens space up for accessible storage. Always surprises me how things open up just by removing doors that aren’t really necessary! For possible siblings, Is the current master large enough to become two kids rooms and you move into Stevenson’s? Looks like each could have access to mb if made door to bath and made closet smaller?